This is my complete episode breakdown of Tiger and Bunny: Part 3 by Manga Entertainment. The tiger and bunny series has gone from strength to strength and this collection is arguably the best yet!! 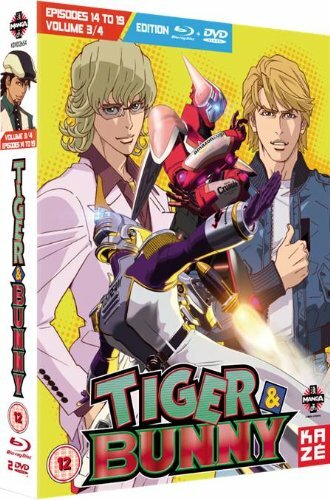 Lets get stuck in... don't forget to support our UK anime distributors and buy tiger and bunny today!! All actors are disguising the kind of heroes Tiger and Bunny are and we don't see these kind of heroes in any where else in movies, anime or cartoons and unique they are themselves. With sponsorships engraved on the characters themselves, the actors talk about how this type of anime is more aimed at adults due to its humour, its fight against crime, addiction and the weight some of the characters are going through may relate to adults who may have experienced themselves. Fire Emblem actor Kenjiro Tsuda, Origami Cyclone actor Nobuhiko Okamoto and Taiten Kusunoki of Rock Bison also talked about their own unique characters that they play and how each one of them have evolved throughout the series. With a few personal questions thrown in to the mix and a visit to the recording studio where the actors take their places recoding for the show, the DVD features offers a great insight of the actors and creators and what their perception are of the show and characters giving you a nice feel that they are connected with them as one, giving the audience a great expectation of how much effort goes into making a series as entertaining as Tiger and Bunny. Now that Kotetsu and Barnaby are both a successful and popular super hero team together, Barnaby has won last season's MVP along with Kotetsu ascending up to 4th place on the rankings and with Antonio descending to last place. Karina realised during a rehearsal for a join concert with Kotetsu and Barnaby, she has some uncertain feelings for Kotetsu; however, with her fellow hero's convincing her otherwise when she breifly mentions it to them. During the concert, a NEXT backstage thief with the ability to become invisible while holding his breathe, obsessed with Blue Rose robs her of her hand bag containing the towel Kotetsu gave her after him ruining it by spilling coffee over it. As a result, the criminal is captured by Rock Bison (Antonio) after Katetsu had a little power anomaly issue with him increasing in strength but running out of time much sooner than usual. Being knocked down to second place, Skyhigh (Keith) is having a hard time and questioning his current abilities to protect the city he once reigned as number one. While walking his dog, he bumps into a young girl named Cis, whom he shares his current concerns with. Skyhigh (Keith) reveals that he is in love with the girl he bumped into and taking advices from the other hero's, he very nervously opens up to this girl about how he feels about everyone will lose faith in him due to his recent excuses about giving up. Kotetsu at the moment is concerned about his recent power anomaly when he is gaining an increase of strength but a shorter time than usual with powering up. Not long after, Cis is picked up by an old strange man named Rotwang who turns out is an old colleague of Barnaby's parents when they worked on robotics technology. Cis is a result of that technology and an android herself. And after seeing a banner with pictures of Kotetsu and Barnaby she goes berserk and draws the two to a fight in the city. As the fight goes on, Kotetsu runs out of power once again sooner than expected. But with Skyhigh (Keith) showing up after somehow being inspired by Cis of not giving up, destroys Cis not realising who she is in her android form after her human disguise has been burnt off. Barnaby has surpassed Legend's all time point score after another encounter with Lunatic. Kotetsu now starts to notice more how much his power time limit is still decreasing with each fight he gets involved in. Barnaby opens up to Kotetsu about his childhood, and how Maverick took care of him after his parents death during Christmas time. Continuously hunted by his fathers memory and recalling how he killed his father (Legend) when he was beating his mother being intoxicated with alcoholism, Lunatic believes killing him (Legend) is the correct force of justice, same with anyone else who breaks the law. Kotetsu learns that Legend had exhibited the same power struggle symptoms as him, causing him to think how he will end up if he does end up like Legend. Later, Kotetsu encounters a criminal known as The lady Killer, but as the fight goes on, Kotetsu's powers runs out quicker than usual once again and with Lunatic showing up after, The Lady Killer is left at the mercy of Lunatic. Kotetsu taking a vacation to visit is family back at his home town. Soon after arriving, his mother and brother Muramasa realises that something is wrong with him, and having a hard time getting to get along with his daughter Kaede. Kotetsu opens up to Muramasa about his powers rent declining and while his was discussing that with his brother, he reminisces back to the time just before his late wife Tomoe's passing and the promise he made to her to always be a hero. The day after, Kaede trapped herself in a temple when a storm breaks out. Using his powers, Kotetsu locates Kaede and manages to rescue her even after his powers had reached its time limit. Now back in the good books once again with his daughter, Kotetsu came to the conclusion he wants to retire from heroism and focus all his time and efforts to his family instead. Kotetsu making his way back to Stern Bild finds that Kaede is a NEXT herself when she is running after the train he is on. Now that Kotetsu has decided he want to retire from being a hero, he is trying to work up the courage to tell the others of his recent decision. Barnaby pays a visit to see Kriem, who has now awakened from her coma since she was in from the Jake incident. Telling Barnaby how Jake saved her life when she was excluded from society by her friends and family for being a NEXT. Just before committing suicide, she reveals to Barnaby that Jake was not the killer of his parents as he was with her on the day of the murder. Barnaby unable to accept Kriem's answer goes into denial and saying he remembers the night of his parents death clearly. And after doing some research, there somethings that don't add up and continuously thinking about it, Barnaby memory of the murderers face keeps changing so he now starts to question what really happened that night of his parents death. "Meanwhile, Kaeda's trying to deal with her recent discovery of her NEXT powers being able to copy othe NEXT powers when coming into contact with them by touching them." Barnaby is taken by Kotetsu to retrace his steps of the night of his parents death to jog his memory to reveal its true memory. Kotetsu help by buying him all the things he had that night to keep things as close as possible to his memory. As they go along during the day, barnaby overhears a conversation between Kotetsu and his mother regarding his recent decision of retiring, and Kotetsu will confront Barnaby soon after he has helped him with his problem. While confiding with Maverick about his recent talk to Kriem about the night of his parents death, Barnaby receives a call from his parents' housekeeper at the time, who has found an old photograph showing her with Barnaby on the day of the murder, instead of Maverick who Barnaby remembers being with on that day. With his, Maverick finally reveals to Barnaby that he was the murderer of Barnaby's parents after they found out he was providing their robotics technology to the Ouroboros to stage out more exciting and entertaining arrests for the coming existence of Hero TV. In the wake of this revelation to Barnaby, Maverick also reveals he is a NEXT himself with the ability to rewrite the memories of others at his will, which he uses once again on Barnaby to conceal the truth and cover his tracks. This compilation is very good with the sound and video quality being very good (usual for a Manga & Kaze release). As many compilations this leaves you wanting more but satisfies you enough to feel like you have not wasted your money. A great release to mach a great series.